To secure his legacy as Governor of the State of California Jerry Brown has been appointing new judges that are seriously affecting the judicial landscape of California. Most of these judges have little or no experience with Landlord/Tenant issues and usually no experience with Unlawful Detainer matters. This has made the filing of a concise, well drafted trial brief more important than ever to educate these new judges on the crucial issues involving eviction. Many of the recent judicial appointees simply lack the requisite understanding of the purpose of the California’s Unlawful Detainer Statutes that can be found in Code of Civil Procedure Section 1159-1179a. The underlying stated purpose of the Unlawful Detainer Statute is to provide a landlord with an expeditious and inexpensive procedure to regain possession of rental units from tenants who have breached the terms of the rental agreement by failing to pay rent or by disregarding other provisions of the rental agreement among other reasons. The statute also provided built-in protection for tenants who are being improperly evicted. The way the courts are processing Unlawful Detainer cases are neither quick or inexpensive. New judges with little understanding of the eviction process are being assigned to the eviction courts throughout the State of California. Unlawful Detainer cases grow more complex each day. The plethora of tenant defenses counsel and their litigation tactics required the landlord’s attorney to be diligent in keeping up with the changes in the law and judges who preside over these types of cases. The purpose of a trial brief that is filed prior to and/or at the time of trial is to educate the judge about the specific facts of the case and the law that applies to each point raised in the pleadings that is before the court. As newer judges are appointed to the bench who are presiding over the eviction cases the importance of a trial brief that is precise and to the point may be the most important tool in the arsenal of a prepared landlord’s attorney. The trial brief should be broken down into a few basic parts. First, it should provide the court with a summary of what type of Unlawful Detainer case is before that judge. Second, it should provide the court with a Statement of Facts that summarizes what the evidence will show at the time of trial. Third, it should provide the court with a summary of the law that applies to each point raised by the parties in the pleadings that have been filed with the court. The pleading are those documents that the court will refer to, along with the evidence presented at trial, to make decision on the case. Landlords should never leave the decision of his or her eviction case to the whim of a judge who may not understand the basic California Laws governing Unlawful Detainer cases and who may be inclined to be tenant friendly. 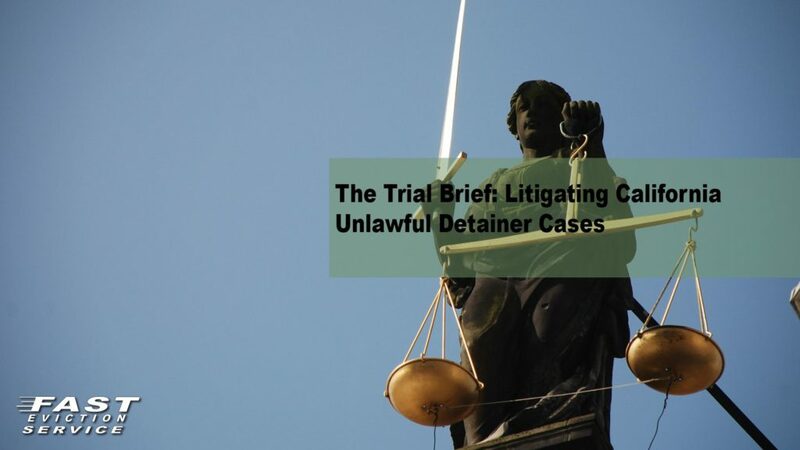 The trial brief is also a very important tool to create and protect the record of the Unlawful Detainer case should that matter require further legal action after the judgment has been announced. A good trial brief is one of the best and least expensive way on helping the judge understand the facts and the law. So, when your attorney calls or emails you, requesting that the landlord approve the preparation of a trial brief to educate the trial judge the landlord should seriously consider that request and, in most cases, give his or her attorney the approval needed to help win the case.